As you may have heard, the Olympic Winter Games were held here in Lake Placid, New York in 1932 and 1980. As a result of hosting two Olympics, there exist facilities managed specifically to host current world-class sporting events. Therefore, one of the best aspects of Lake Placid is the cornucopia of cool events and activities available for spectator or participant. This should come as no surprise to the astute reader of this blog or visitor to the Lake Placid region. Not only does the fragile economic health of Lake Placid subsist largely on the region's ability to host athletic events, but the role of event host has in many ways become a defining cultural attribute of the Village of Lake Placid and the surrounding region. If the ability to host a sporting event is integral to the economic health of Lake Placid, then it is safe to say the multitude of committed and loyal event volunteers are the region's lifeblood. From the local ski race to Ironman Lake Placid, these events simply could not happen without volunteer staff. Despite the lack of pay, volunteer workers perform essential tasks. As any sporting event organizer will tell you, no volunteers equal no event. I know of which I speak. When I was Executive Director of the Adirondack Sports Commission, the organization responsible for closing the initial deal that brought Ironman to Lake Placid in 1999, our volunteers were the most important and valued part of our staff. Our volunteer database was guarded and protected better than the secret sauce recipe! Clearly, events of all size rely on volunteers. In order to hold the 2012 Olympics in London, organizers are recruiting 70,000 volunteers, or "Game Makers," who will perform everything from distributing results, greeting visitors and athletes, to collecting tickets and helping with crowd control. Held January 15 and 16 in 2011, the St. Lawrence University (SLU) Winter Carnival is a great example of a volunteer staffed event that has been hosted in Lake Placid and Wilmington for many years. 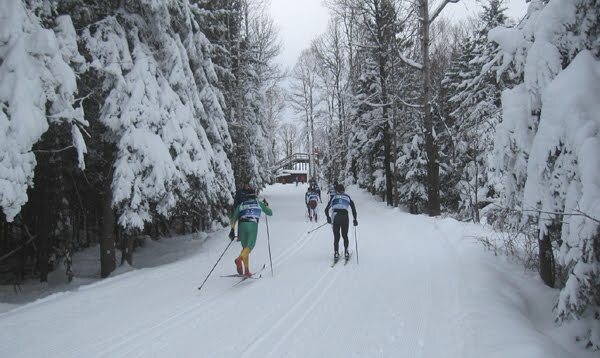 Without the ready and willing cadre of loyal volunteers, this historic collegiate ski racing event would not occur. 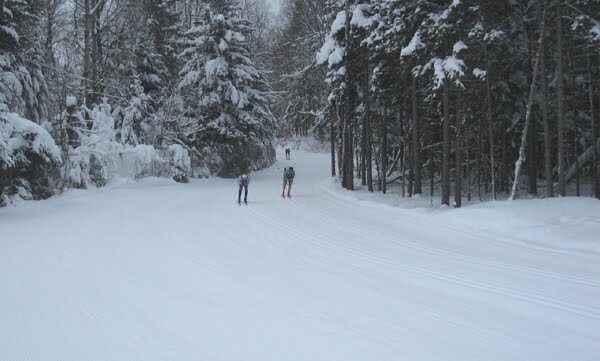 The kick-off event for the Eastern Intercollegiate Ski Association (EISA), the SLU Winter Carnival is the first of 6 Winter Carnival competitions held throughout the Eastern United Sates. The institutions represented at the race were: Bates, Bowdoin, Colby, Dartmouth,Harvard, Middlebury, St. Michaels, St. Lawrence, University of Maine, University of New Hampshire, University of Vermont, and Williams. These schools all sponsor National Collegiate Athletic Association (NCAA) varsity skiing programs and field teams in men's and women's alpine and cross country skiing. The season culminates with the EISA Championships at the end of February and the top individuals qualify for the NCAA Skiing Championships in early March. An important part of ski racing in the United States, intercollegiate ski races or "Carnivals," have been held since the early 1900s and have traditionally provided top-level competitive opportunities for academically inclined ski racers. 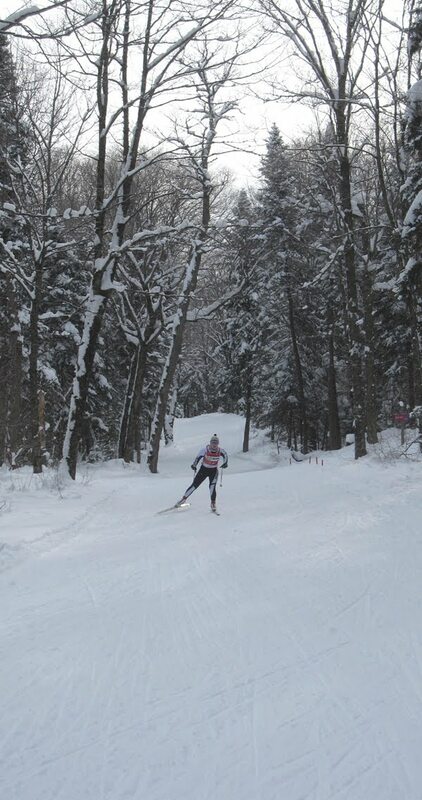 Ski racing has always been a grassroots effort, and intercollegiate ski racing is no exception. I'll spare you the history lesson, but without ski-crazed people working for the love of the sport, ski racing would be a different sport. Holding down a volunteer position at events has it upside for workers as well. I recently had a chance to work as a volunteer both days of the cross-country ski races for the SLU Winter Carnival and had a wonderful time. It was a good opportunity to visit with fellow volunteers and ski-obsessed friends, and check out the latest ski gear and gizmos. I was also able to spend two entire days outdoors; a treat in itself. Some of the best skiers in world were on hand creating a contagious crackling competitive energy that cannot be beat. Great ski competition and the camaraderie of fellow ski volunteers working together created a win-win situation for all, even those of us not participating in the race. If you would like be an essential part of a Lake Placid and New York State winter tradition, the region will host the Empire State Winter Games this February 25 -27 and volunteers are always welcome! Internet access is still an issue. 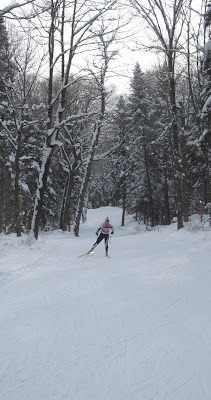 I have posted to the Lake Placid Visitor's Bureau blog. Thank goodness skiing is great. It has been cold and snowy so I've managed to entertain myself on skis. Yes, without the internet. As a matter of fact, it is snowing out right now. I guess I'll have to go skiing. Today's featured photo is a shot from the recent St. Lawrence University Winter Carnival hosted here in Lake Placid, January 15 and 16.